Could You Have An Electrolyte Imbalance? If you just aren’t feeling “quite right” it could be an electrolyte imbalance. Thankfully if that is the issue it’s an easy fix. Let’s Start with the Basics – What Are Electrolytes? Electrolytes are body contained minerals essential to nerve, brain, and muscle function. Too little or too much can be detrimental to your health. Most receive electrolytes by way of diet and beverage intake as well as some supplements and medications. Small amounts are found naturally within the bodily fluids but they need to be replenished regularly. Electrolytes remain mostly in a state of flux. They depend on your fluid levels and daily activities. Any time you sweat, throw up or use the restroom electrolytes are leaving your body. Any time where excess fluids leave the body faster than is normal – exercise, hot weather, or illness you could be at risk for dehydration. Dehydration is a condition which goes hand in hand with electrolyte imbalance. Other medical issues can also result in electrolyte imbalance. These include eating disorders, alcoholism, kidney disease, diabetes, congestive heart failure, thyroid disease, and injury or trauma. 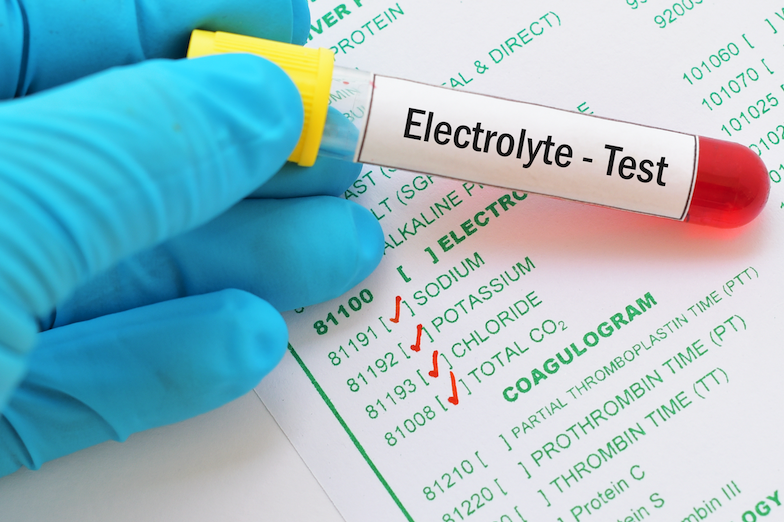 Mild electrolyte issues may present with no symptoms at all. These levels are usually only found by happenstance by way of routine blood tests. If you experience severe signs that you are dehydrated seek emergency medical care immediately as an electrolyte imbalance caused by dehydration can be life-threatening. Electrolyte imbalances are addressed by supplementation or IV fluids in order to rehydrate quickly restoring depleted minerals. Your physician will also want to address your electrolyte imbalance long term, this means going over and reviewing your diet. You may at that time be referred out to a nutritionist. Eat a diet abundant in fruits and vegetables, especially sweet potatoes, bananas, tomatoes, and avocados. It’s important to drink water but don’t force it. Conversely, overhydration can lead to nausea, diarrhea, and vomiting, this, in turn, can lead to further dehydration and the loss of important minerals. If you are in the Tampa area and are concerned about a potential electrolyte disorder or would just like general advice on keeping a balanced diet and healthy lifestyle, make an appointment with the on-site nutritionist available to you at Tampa Cardiovascular Associates by calling (813) 975-2800 today. www.tampacardio.com.